This subduction-inspired desk brings planetary dynamics to a home-office scale. The layers of coloured wood draws on geology for the colour scheme, while the sliding drawers evoke the heat of molten rock. When two tectonic plates of different density collide, the denser one subducts under the more buoyant plate. When continental plates encounter oceanic plates, land always floats as the denser oceanic plate is drawn, pushed, or pulled by its own weight deep into the earth. When two oceanic plates collide, the older, colder plate subducts under the younger, hotter plate. As an oceanic plate subducts, heat and pressure drives the moisture out of saturated ocean-floor sediments. The addition of water alters the melting temperature of rock, triggering the generation of magma. This molten rock erupts, forming stratovolcanoes. 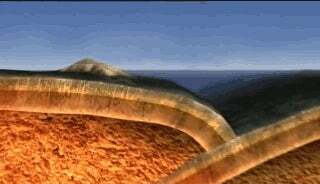 The classical markers of a subduction zone are a deep ocean trench at the zone, an accretionary wedge of material scraped off the subducting plate onto the overriding plate, and a row of violently explosive volcanoes. The Pacific Northwest in North America is a subduction zone, as most of the Pacific Rim of Fire including the west coast of South America and Japan. Designer Paul Venaille of Color Craft drew on the impressive geodynamic process of subduction as inspiration for a clean-lined desk titled Bureau Subduction. Before you get your hopes up, the price is available "upon request," a perpetually-ominous phrase. The desk is built of two pieces: one stable, and one moving. This evokes the movement of plates, where the one we're standing on is a fixed point compared to the plate rushing at it at the towering pace of centimetres a year. (Fun fact: plate tectonics move at about the same pace your fingernails grow; remember that every time you trim your nails!) The surface is 300 sheets of wood laminate bonded together, building layers into a solid block reminiscent of geologic strata. Even the number of drawers are tectonically symbolic: 12 storage modules corresponding to the 12 named existing global surface tectonic plates. The colour tones are reds and oranges, glowing with the heat of molten rock. That's particularly suitable as the enclosures are in the moving subducting plate of the desk. Finally, the steel legs give the impression of fragile instability. The artist statement references that as evocative of unbalanced plate movements, but I prefer to think of it as the landslides that plague the young, unstable slopes of volcanoes. Images credit Paul Venaille, who you can contact for sticker-price on the desk. Hat tip to Agile* Geoscience. For more terrifyingly-priced home design, try a time-warping patio, astronomy area rugs, or a mind-boggling expensive watch. For something a bit more affordable, consider dinosaur rolling pins and quantum mechanics earrings. A tree so mighty it deforms space itself! This Baker Made a Laser-Engraved Rolling Pin. Now She Has Dino-Cookies!